Pacific Hoists addresses five key questions about searching for the right product in the JDN range of air hoists. What are the benefits of using a JDN air hoist? There are several benefits to using JDN air hoists including true vertical lift on all sizes; easy handling; accurate speed control with high torque; and low weight compared to electric hoists. Which hoist is suitable for my application? JDN’s Mini is recommended for the light duty sector as a handy, flexible and universally deployable hoist, making it an ideal tool for most handicraft workshops. The Mini is available in carrying capacities ranging from 125kg up to 980kg. JDN’s PROFI Series air hoists are built robust, making them suitable for tough industrial applications and even in continuous working processes. These air hoists are available with various control systems based on requirement. Different trolleys are also provided for traversing loads to meet specific demands. The PROFI Series is supplied in carrying capacities ranging from 250kg up to 100t. JDN air hoists M and B series are designed for mine operations. How are JDN air hoists protected against overload? 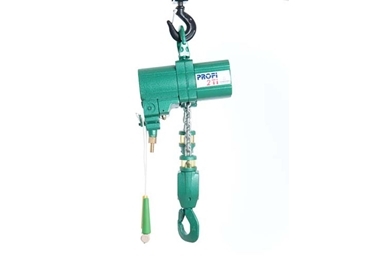 JDN PROFI Series air hoists are compliant with the machine directive and offer overload protection on all products with SWLs starting from 1000kg. The sophisticated control system stops the hoist in the event of overload. To be unlocked, the stopped hoist has to be lowered using the pendant control to release the latched overload device. Additionally, the pneumatic motor simply stops without any damage. The overload protection also prevents overheating in stall torque as well as jamming. No special protection facilities such as PTC elements are required. With pneumatics, short term pressure can be increased within the maximum load of the hoist. How many starts and stops are permitted with a full load? There is no limitation in the starts and stops allowed per hour. Which protection class do the JDN air hoists have? On electric equipment the compartment or case is classified according to IP or NEMA. For example IP68 refers to a housing safeguarded against dust ingress and submersible for a certain time according to manufacturing specifications. Being an open system, air hoists are sturdy and insensitive to dirty, aggressive and humid environments; the supply air also blows out any ingress. These attributes make the air hoist a unique and reliable tool in harsh environments.